« How Evenly Distributed Is Your Daily Bible Reading Plan? 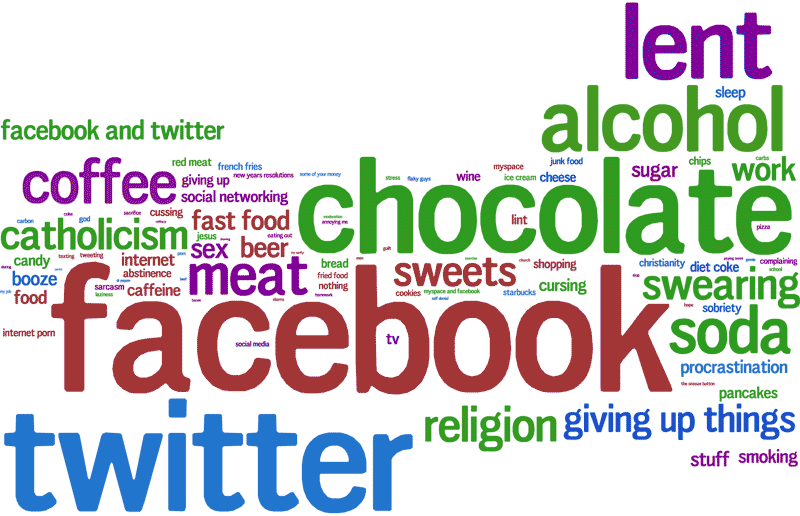 Some you’d expect (alcohol, chocolate), some are ironic (giving up Lent for Lent, giving up giving up things), some are odd (pants, lint), some are anti-religious (religion, Catholicism), and some are tech-related (Facebook, Twitter—even “Facebook and Twitter” makes the list). Created using the Twitter Search API and Wordle. Data based on analysis of 15,000 tweets from February 22-26, 2009. This entry was posted on Friday, February 27th, 2009 at 8:50 am	and is filed under Lent, Twitter, Visualizations. You can follow any responses to this entry through the RSS 2.0 feed. Both comments and pings are currently closed.